Ants are the most efficient and numerous of all predaceous insects. Some ants, such as certain species of Formica, can be used in orchards to help control pests and reduce reliance on pesticides. Ants can prey on a wide variety of insects. Their primary role in orchards is as predators of pear psylla on pear. The egg is white and oval. The larva is shiny white and elongated. The pupa is a dull white or tan. Adults range in size from about 1/12 inch (2 mm) to 1/2 inch (12 mm). Many are black, but there are also red, brown and yellow species. The head is large with long, elbowed antennae and is joined to the thorax by a thin neck. The thorax is connected to the abdomen by a narrow, flexible waist, or petiole. In some species, the petiole is just one segment, while in others it is two segments. The swollen part of the abdomen behind the petiole is known as the gaster. During part of their life cycle, when they mate and disperse, the reproductive ants have wings. A typical ant colony consists of sterile female workers and soldier ants governed by one or more queens. The queen lays eggs. Worker ants forage for food, maintain the nest and care for the queen and her developing brood. Soldiers defend the colony and its resources from enemies. Ants overwinter as adults in a colony. In the spring, the queen resumes egg laying. A queen can lay thousands of eggs each year. Workers carry the eggs to nursery chambers in the nest. Larvae are fed and cared for by workers. After several weeks, the larvae develop into pupae from which worker and soldier ants later emerge. Once or twice a year, usually in the late spring and early fall, a special brood of eggs develops into winged male and female reproductive ants. Swarms of these ants leave the nest to mate and disperse. After mating, new queens either move away to establish new colonies or, in species that have more than one queen per colony, they may stay in the nest. Once established in a nest, the queen sheds her wings. Males die or are killed soon after mating. Queens usually mate only once and use stored sperm to fertilize eggs for the rest of their lives. 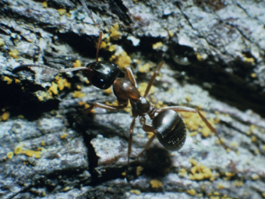 Over the centuries, predaceous ants have been exploited in countries around the world to control a variety of pests. Ants can be used in orchards to help control pests such as pear psylla and reduce reliance on pesticides. Ants eat psylla nymphs and young adults and also remove honeydew, reducing fruit russet. Some ant species will farm, or tend, other plant-damaging insects. For example, the ants may feed on sugar produced by aphids and protect the aphids from predators and parasites in return. But some researchers believe that honeydew-producing insects such as aphids help scatter the ants throughout the tree, enabling them to protect the plant better from other, more damaging pests. If undisturbed, ants will establish permanent colonies and build up to large numbers. In most orchards, ants have been eradicated by pesticides. However, ant colonies can be collected and reintroduced. If the mosaic can be preserved in an orchard, predatory ants can contribute significantly to pest control within two years of introduction. Formica neoclara and Formica podzolica are appropriate species to use in orchards. Both are indigenous to Washington’s pear growing regions. They have more than one queen, which greatly increases the reproductive capacity of the colonies and lessens the risk of a colony failing to become established if a queen dies. They are not aggressive, do not sting, and seldom tend aphids. Both species nest in the soil, forming low mounds that are easy to excavate and do not interfere with orchard equipment. Other closely related species, such as Formica montane, could also be used. After ant colonies have been introduced, they must be protected and allowed to spread throughout the orchard. The two greatest threats to ant colonies, particularly new ones, are pesticides and physical damage to the nests. Most orchard practices do not harm ant colonies, with the exception of disk tillage to control weeds, which destroys nests. Other weed controls, such as herbicides, should be used if ants are in the orchard. It is relatively easy to conserve ant populations in organic orchards because pesticides such as Bacillus thuringiensis (Bt), granulosis virus, rotenone and other products certified for use in organic orchards are not toxic to ants. In conventional orchards, apply pesticides when ants are least active and use compounds that are the least toxic to ants. Ants are not yet active when dormant sprays are applied. Later in the season, ants are least active between about 10 p.m. and 4 a.m. They are also relatively inactive from about 11 a.m. to 4 p.m., particularly on hot days. Organophosphate and carbamate insecticides are highly toxic to ants, and their residual effect can last for up to two weeks. Synthetic pyrethroids also are toxic to ants, but they are effective for only about a week. The best compounds to use with ants for pear psylla control would be insect growth regulators, which have little effect on foraging ants. Good dormant control of pear psylla is essential where ants are used as biological control agents. Pear psylla begin to reproduce at least a month before ants become active in the spring. Early season chemical control is needed to keep psylla populations below damaging levels until the ants begin foraging. Colonies contain large numbers of ants that consume large quantities of food. A colony with multiple queens can have an enormous number of workers, perhaps 300,000 or more. Often, there are networks of colonies containing millions of foraging workers. Predation is not limited to a particular prey species or stage. Worker ants will continue to forage even when satisfied. They hunt for the brood, the queens, and other workers in the nest. Ants can survive temporary food shortages by living on stored food reserves. Ants forage throughout the orchard and can efficiently exploit new food sources through chemical communication. Ants are active for long periods, both on a daily and seasonal basis. Use wooden nesting boxes to collect, transport and transplant ant colonies. The box size depends on the size of the colony, but usually a box measuring 12 inches by 24 inches and 16 inches high is large enough. The best material is a low-grade white pine. Do not use treated lumber and wood products, such as particle board and plywood, as they contain compounds that could harm the ants. Heavy plastic garbage bags, doubled for extra strength, can be used instead of wooden boxes, but they do not protect the colony very well during handling. To stop ants escaping, make sure the box’s joints fit tightly. Use duct tape as a sealant. Collect the colonies by carefully shoveling nests directly into the nesting boxes. During collection, separate and discard empty nesting material, rocks and debris from material containing brood and workers and discard. It is best to collect colonies in the early spring before they become active. Also, more ants will survive transplanting during mild spring weather. Before sealing the boxes, put cotton saturated with honey and water inside with each colony. If the nesting material is very dry spray a little water into the box. After sealing the boxes, try not to disturb them. Keep boxed colonies for one to two days in a cool, dry, shady place before burying them in the orchard. Holding the ants increases the chances of successful introduction. In the orchard, dig a hole for the box in an area that will not be disturbed or flooded by irrigation. Ideally the site should be exposed to morning sunlight but shaded in the afternoon. Drill several exit holes, about 1 inch (2.5 cm) in diameter, through each side of the box before lowering it into the hole and burying it under 3 to 4 inches (7 to 10 cm) of soil. Ant colonies usually do not stay in the nesting boxes, but establish new nests nearby. The box protects the ants during transit and their early days in the orchard. With careful handling, most ant colonies will survive.